I could be wrong here, but I feel like these days, the wedding cake holds a position of much greater significance than it had in the past. 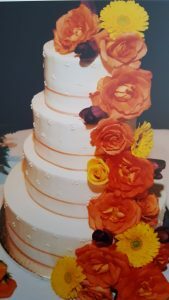 The cake is often viewed as the centerpiece of the reception and most couples want the cake to reflect the style or theme of their wedding, in more ways than just the color of buttercream roses that adorn the cake, a la 1976. 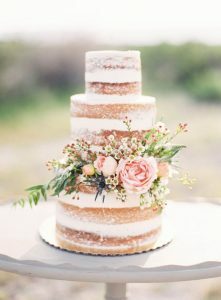 As a baker, I LOVE that bridal couples are using their wedding cake to express their style and personality! I have been working on designing a wedding cake this week, and looking at all of these wedding cakes really had me reminiscing about my wedding cake. 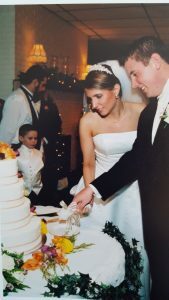 Ryan and I were just babies when we were married in 2006 (barely 21 years old!). These were the days before Pinterest came on the scene. I swear that there were only 10 styles and 15 colors to choose from when we shopped for bridesmaid dresses! There are so many options now! Ryan says that he doesn’t even remember this cake. Clearly, he was there and saw it. He must have just been swept up in my beauty and his love for me. Yup, that’s totally it. I chose a very simple and clean design. It was buttercream frosted with a triple swiss dot pattern on all four tiers and ribbon around the bottom of each tier. Our florist added the fresh flowers that matched the centerpieces and bouquets. Thinking back, I loved this cake. It was just what I wanted at the time. But now, I don’t think that I would choose this type of design if we were getting married today. Which brings us to the (imaginary) future. He said that he liked how clean this cake is and how it tells a story. I am probably totally reading into things here, as I am known to do, but when I look at these three silhouettes, they remind me of specific moments at the various stages of our relationship. How sweet! Like Ryan’s choice, this cake is VERY clean and simple. 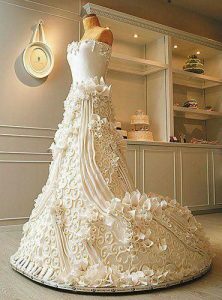 The only thing that I might add is a strip of edible lace with scalloped edges across the middle of the very top tier. 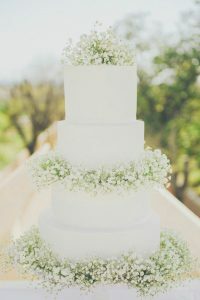 I love the simple elegance of this cake. It’s understated, but it is breathtaking. Do I see a single tier anniversary cake in our future…? So, what about you? 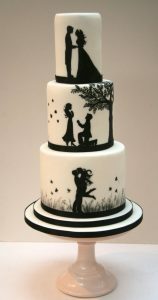 What did your wedding cake look like? Would you choose the same design now, or something totally different?